Having spent a whopping $1.2 trillion in 2017, enterprises large and small are investing heavily in Digital Transformation strategies. 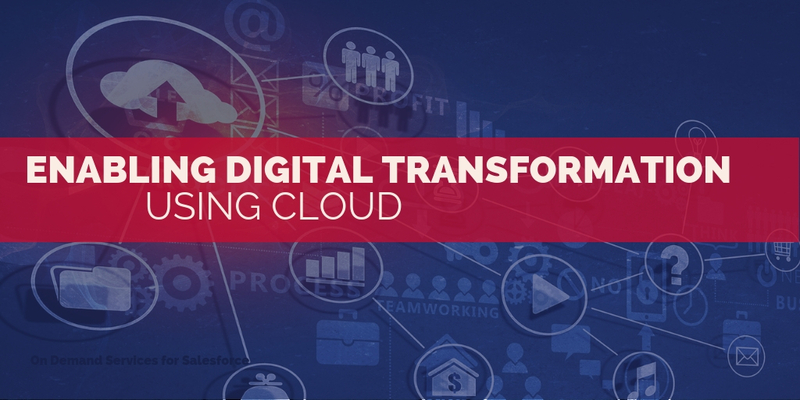 And the cloud is one of the key tools that leverage key technologies like Big Data, machine learning, augmented reality, Chatbots, IoT and others for enabling Digital Transformation. As IT buying decisions increasingly involve the business executives and with the increasing need for the IT team to leverage the possibilities to develop, deploy and deliver fast, the role of Cloud Computing has become even more significant in enabling Digital Transformation of an enterprise. Consider the fact that the total global public cloud market is an estimated $178 billion in 2018, up from $146 billion in 2017, and will continue to grow at a compound annual growth rate (CAGR) of 22% according to the Forrester Research. Read on to explore the Top 5 ways in which the Cloud infrastructure is enabling Digital Transformation across Enterprises at scale. Enabling Digital Transformation requires an organization to pivot its business processes several times. Cloud offers a unique platform where they can quickly build, test, and deploy apps on different platforms during the transformational phase without setting up a complex infrastructure. Cloud computing offers the essential computing resources, infrastructure and platforms on the go, saving the organization from the cost, time and hassles of investing in different IT resources. Also, there are plenty of Prototyping tools available for you to test your applications in a Cloud environment. For instance, here’s how you can Take advantage of AWS Free Tier to get hands-on experience with the AWS Platform. IT cost savings is perhaps one of most significant benefits of Cloud in enabling Digital Transformation. The Cloud environment allows you to scale up or down resources and lets you Pay only for what you use thereby saving you a substantial amount of cost of purchasing and management of IT infrastructure. While Cloud infrastructure enables you to eliminate Capital expenditure, Organizations still face challenges with managing operational costs of Cloud migration. According to the RightScale 2018 State of the Cloud Report, over 80% of enterprises surveyed cited managing Cloud spends as one of their key challenges. With over half of enterprises (52%) spending more than $1.2 million per year on Cloud services and 26 percent of companies spending a staggering $6 million on Cloud, it has become increasingly significant that Organizations identify strategic ways to Manage Cloud costs for optimizing the benefits of Cloud migration and enabling Digital Transformation. Business Agility is the quality that allows an enterprise to embrace market and operational changes as a matter of routine, according to Craig Le Claire, VP and Principal analyst at Forrester Research. Business Agility improves overall operational efficiency, drives down costs, fosters innovation and enables organizations to quickly create new products and services. And Cloud services are one of most utilized tools in fostering Business Agility and enabling Digital Transformation. While a physical server could possibly take days or weeks to be implemented, a cloud server takes minutes, giving you a sustained competitive advantage. According to Harvard Business Review’s cloud survey, Business Agility leads the list of drivers for adopting Cloud, with 32% of respondents citing it as the primary reason to migrate to Cloud. It is prominent that organizations can Get to market faster with Cloud services and shorten the time for new business launches. According to Forbes Insights: Collaboration in the Cloud, the ability to mingle across geographical parameters, time zones or even organizational borders is becoming an ever more critical foundation for success. And Cloud Computing is a key enabler of successful organizational collaboration and improved productivity by allowing you to access, retrieve and process information anytime, anywhere. Collaborative work based on Cloud migration has proved to be competent in fostering collaboration of the most diverse teams and enabling Digital Transformation across the organization. Businesses face the risk of losing critical data due to unexpected system shutdown, data breaches when data is maintained in-house. Moreover, the chances of data failure increase considerably with big data analysis. Cloud hosting can reduce this risk by creating multiple backups of your data in a secured medium thereby enabling Digital Transformation for your company. It offers multiple levels of security and control in network infrastructure to ensure data protection and continuity. However, Organizations are still wary of adopting cloud for security reasons including Data breaches and Data loss. To ensure that the most significant and confidential data you store on the cloud is safe, it is critical that you take the strategic measures to Keep your data secure on the cloud. To learn more about how you can harness the benefits of Cloud to become digitally transformed enterprises, Talk to our team!